I usually go for blockbusters if I am going to see something in the theater. Let’s face it, going to the movies is expensive. I usually go for the sure thing, something I am certain will entertain me. But then I saw the trailer for Warm Bodies and I just couldn’t help myself. My daughter and I went to see it opening weekend, and we both LOVED IT. 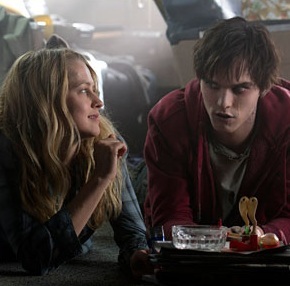 Warm Bodies is Romeo & Juliet of the zombie world. So much so, that characters were created and named based off of Shakespeare’s play. R (“Romeo”, Nicholas Hoult) is a very slacker zombie who can barely form a single word, but has an extensive internal dialogue. He’s extremely self-aware, feels guilt and sadness, and clings to what he imagines his “alive” life was probably like. He has an affection for music on vinyl, collects memorabilia, and tries desperately to be smooth in front of girls. He even has a friend, M (“Mercutio”, Rob Corddry) he often exchanges moans and grunts with. When he meets Julie (“Juliet”, Teresa Palmer), there is an obvious shift in his world. Rather than wanting to eat her brain, he has the unusual urge to save and protect her. Julie is terrified and confused by this turn of events, but by the time she is able to return to the area where unaffected humans are (and her friend Nora, “Juliet’s ‘Nurse’, Analeigh Tipton), she finds she has grown fond of R.
The rules in this zombie apocalypse universe are slightly different than previous versions, but are still close enough to take the leap and be entertained. This is not a heavy, dark movie, despite the theme, but rather a comedic story of hopeful redemption and love. I found a few weak points in the film, and sadly John Malkovich was one of them. His part was cliche and rather dull for an actor of his caliber. But overall the movie was entertaining and worthy of at least a couple of more viewings. Anyone else get a chance to see it yet? Posted on February 17, 2013, in Film and tagged nicholas hoult, rob corddry, teresa palmer, warm bodies, zombies. Bookmark the permalink. 5 Comments. You need to get on that!!! I want someone to go with and no one will because apparently there was a giant party I wasn’t invited to and they all went together! 😉 Seriously though, like everyone I know went on the same day, lol. Good review. Overall, this is a good movie with the zombie and romance element not backfiring on them and tells a compelling story with a good chance of them doing it well.